What an exciting day we had! Team Smiley was ecstatic to be involved in the 11th annual Summer Reading Extravaganza hosted by the Carnegie Library. This was the team’s first big event of the summer. We could not have imagined a better way to spend the beautiful Sunday afternoon than with hundreds of children excited about reading! The Extravaganza is a very cool event that encourages summer reading and helps the library deliver learning opportunities to citizens of Pittsburgh. Everyone had an awesome time and our cookie decorating station was a huge hit among the crowd. Our guests creatively decorated over 1000 cookies ranging from the traditional smiley face, to cookies decked out as characters from their favorite books. Our team also distributed over 3,000 additional cookies! It was a great day for everyone, especially Smiley who was overjoyed to pose in pictures with his fellow lovers of reading! We had an amazing day and were so happy that we were able to celebrate such a fun event with all of you! Don’t forget to visit Smiley’s Photo gallery to check out all the fun! Join us at Eat'n Park for Smiley's Birthday - and 99-cent kids' meals! This promotion ended on July 29, 2011. Smiley is celebrating a milestone occasion this summer: his 25th Birthday! And this cookie likes to party, so he’s got a slew of special events planned over the next month. Read on, then join in the fun! They’re back! From June 20 through July 29, 2011, all kids meals are 99 cents* – all day, every day! Plus, every child will receive a special birthday treat bag full of fun stuff like tattoos, stickers, a special birthday wristband, and (of course) a Smiley Cookie. Smiley and a bunch of his mascot pals will rendezvous at the Carnegie Science Center in Pittsburgh for a birthday bash you won’t soon forget! Friends like Kenny the Kangaroo, the Pirate Parrot, the Nittany Lion, and more will be there to wish Smiley a happy birthday. Visitors can decorate their very own Smiley Cookie, and enjoy a slice of Smiley’s birthday cake! The party is happening on Saturday, June 25, from 11:30 am-1:30 pm. Be sure to stop in to Eat’n Park before you go – you can pick up a coupon for half-off a child’s admission with the purchase of an adult ticket. Click here for more info. 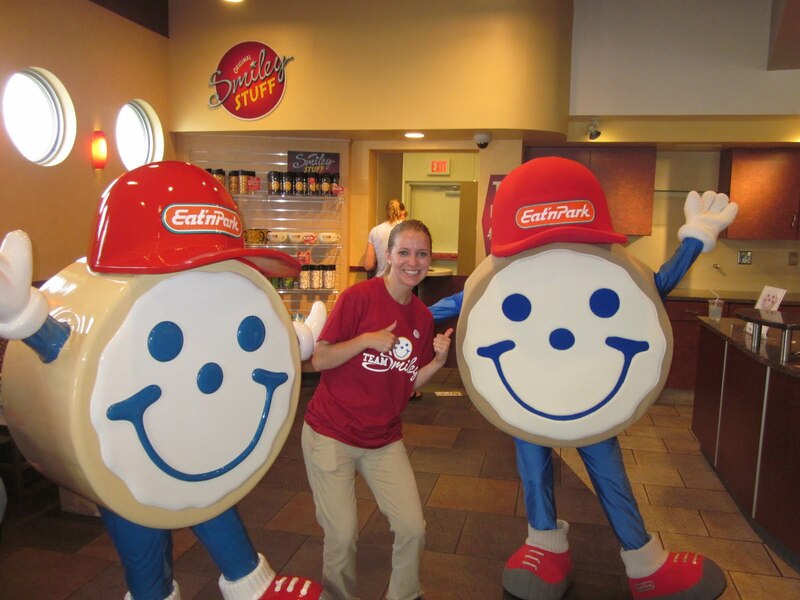 Find Smiley at your local Eat’n Park! Throughout the summer, Smiley will be visiting many of our restaurants for special birthday celebrations. 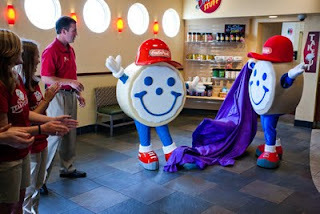 Stop by during Smiley’s visit, and you’ll get to meet the big guy! Kids will also be able to decorate their own Smiley Cookies. 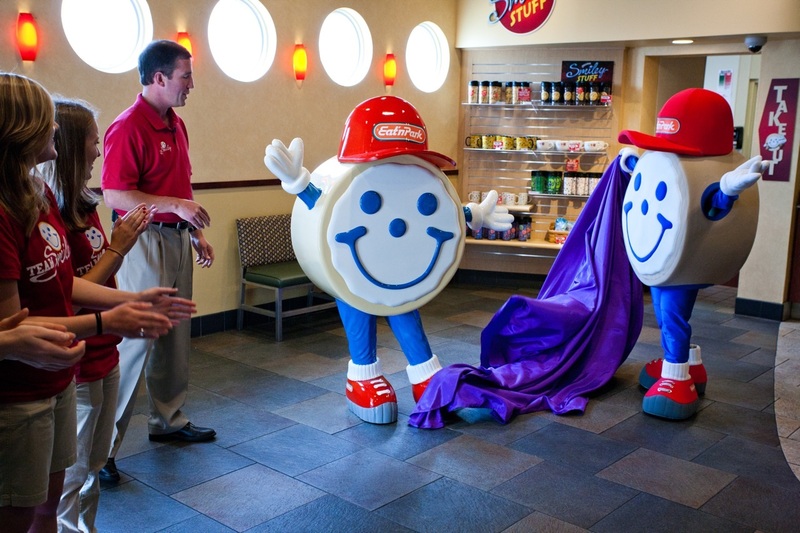 Click here to see when Smiley will be visiting your local Eat’n Park! 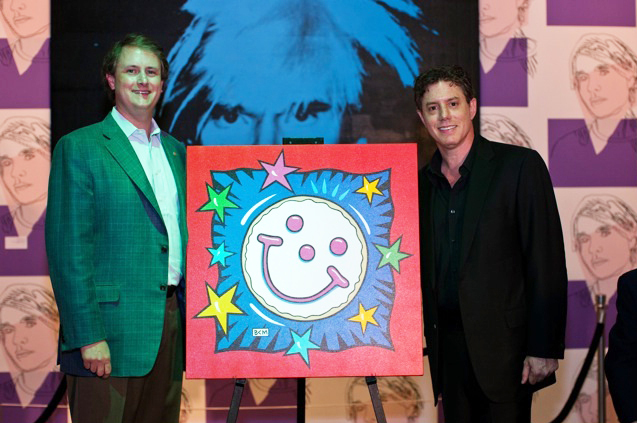 World-famous artist (and Pittsburgh native) Burton Morris has chosen Smiley as his latest muse! Known for his bright, fun, “post-pop” style, Burton Morris has often been compared to Andy Warhol. His rendition of Smiley’s iconic face is bursting with color! You’ll find it on mugs, magnets, and more at our restaurants. Click here to learn more about Burton’s work, and see how the Smiley Cookie inspired him. 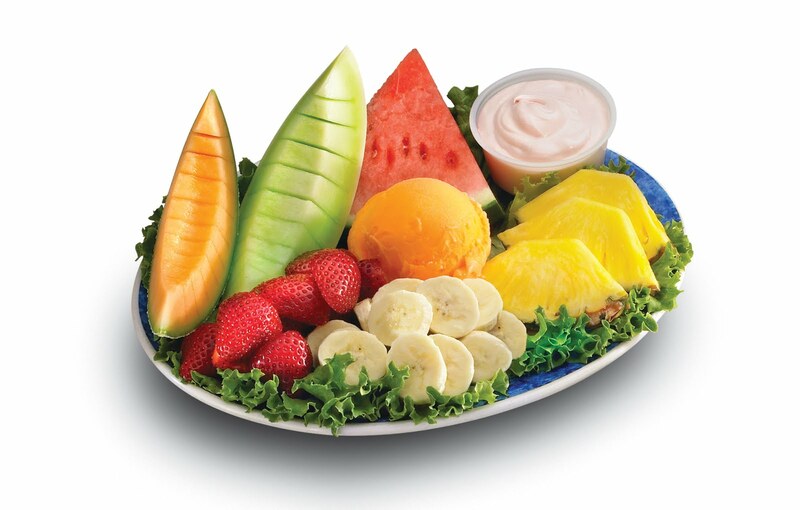 *99-cent kids' meals not valid on breakfast or brunch buffets or on takeout. Guest check must include one adult meal. Kids' treat bags available while supplies last. On Friday, June 10th, Smiley and his team had the pleasure of attending the Special Olympics of Pennsylvania Summer Games. For the event, Team Smiley loaded the Cookie Cruiser with dozens of cookies and traveled to State College, Pennsylvania. This truly special event was not only rewarding for the athletes, but also for the parents, volunteers, and Team Smiley as well. In between events, athletes and other participants stopped over to the Cookie Cruiser to decorate their own cookie. All the while, Smiley walked around the event making life-long friends. It was a great day for everyone who attended, and we're looking forward to returning next year. Congratulations to all the participants of the Summer Games! P.S. We took a ton of great photos - click here to check them out! Summer is heating up, and another season full of festivals, fundraisers, and community events is just beginning for our newest team members: Team Smiley. Every year, a group of fresh new faces joins us to take Smiley and his Cookie Cruiser on a summer tour. You might find them at a charity walk in your neighborhood, or maybe you’ll see them at one of our restaurants, or perhaps you’ll cross paths at a local festival. Wherever you meet them, you can be guaranteed one thing: you’ll walk away with a smile! They’ll be blogging about the events they visit, as well as sharing their photos in our photo gallery throughout the summer. But who are these die-hard Smiley dynamos? Well, read on! Without further ado, here they are: Team Smiley! Hi, my name is Judy and I am majoring in marketing and public relations at Baldwin-Wallace College, near Cleveland, Ohio. My hometown is Center Township, northwest of Pittsburgh in Beaver County. My favorite meal at Eat’n Park is the Buffalo Chicken Salad. Yum! For dessert, my favorite Smiley Cookies are the Halloween ones with the adorable candy corn eyes and nose. I cannot wait for all of the fun in the sun this summer with the Cruiser Team! Hi everyone! My name is Aryn and I am a Public Relations major at Penn State. I am so honored to be a part of Team Smiley 2011. Not only does Eat ’n Park have a family friendly environment, but they give back to the community that helped make them a success. My favorite thing at Eat ’n Park (other than the Smiley Cookies, of course) would be the milkshakes, which are great during the sizzling hot summers here in Pittsburgh. My family and I have grown up with Eat’n Park and I am proud to call myself a member of Team Smiley. Hi! My name is Juliann and I am currently a senior Advertising/Public Relations Major at Point Park University. I love traveling, especially to the Caribbean. I also love blogging, yoga, dancing, and giving back to the Pittsburgh community in any way. My absolute favorite thing from the Eat'n Park menu is pie. From Strawberry to Coconut Crème, I enjoy them all! Other than my passion for pie, I love to make kids smile. I am so grateful to spend my summer spreading smiles with my fellow Cookie Cruiser team and our good friend Smiley. I look forward to a fun-filled summer serving as a brand ambassador for one of the most iconic brands in Western Pennsylvania. Hello everyone! My name is Lauren and I will be a senior advertising and public relations major at Point Park University. In my free time, I like going camping or watching really old movies. I’m born and raised in the Pittsburgh area, so leaving for college wasn’t really an option for me. I love everything about this city, especially Eat’n Park! It just wouldn’t be the ‘burgh without that iconic Smiley Cookie! Eat’n Park is a great company to work for. They really care about their team members, guests, and the community. I am really excited that I get to be a part of that on Team Smiley. I am a very happy person and I love to make people laugh. So make sure “yinz” come out and meet Smiley this summer. You can put a smile on a cookie and our team will put a smile on your face! Hi! My name is Shayne and I am a proud new member of Team Smiley. I was born and raised in the town of Sewickley, PA where I live with my mother, sister and black lab, Max. I am currently a student at Loyola University of Maryland in Baltimore, where I am majoring in Communications and minoring in Sociology. In my spare time, I enjoy cooking and traveling. I actually have the amazing opportunity to be studying abroad in Belgium for my junior year of college, which I am eagerly anticipating. I am also an avid runner and am currently training for my first half marathon in July. I’m very excited to be a part of the Eat’n Park family and am looking forward to celebrating Smiley’s 25th birthday with all of you this summer! Baked Chicken Bruschetta Alfredo - Eat'n Park's "Best New Recipe" Contest Winner! If you happen to be driving into Pittsburgh by way of McKnight Road, you will see a small Eat’n Park on your right. Next time you're in the area, be sure to take the time to stop in and say hello to one of our most creative cooks, Rachel Welch. We call that restaurant #13, but it was a lucky number 13 for Rachel, who was recently named the overall winner in our Best New Recipe Contest. The contest began last July and was open to all of our 1,251 cooks. Each cook with a new recipe idea prepared that dish for the management team in their restaurant. That team of managers chose the best recipe to represent their restaurant against all the other restaurants in their region. One winner from each of our seven regions was chosen. Now the seven regional champions ventured to our test kitchen in Homestead to personally prepare their best new recipes for our panel of judges, including celebrity judge Shelley Duffy from the Star 100.7 morning program. In the end, Rachel came out the victor. Her creation, Baked Chicken Bruschetta Alfredo, made it through the testing process and became the first dish chosen to be featured as a special at Eat’n Park Restaurants. Rachel's idea is a great twist on one of last year's summer favorites. She took our Baked Chicken Bruschetta and sliced it over a bed of spaghetti. The addition of bacon, a creamy Alfredo sauce, and our homemade bruschetta topping made this dish a winner! Now if you can’t get to our restaurant on McKnight Road to have Rachel make her award-winning dish for you personally, be sure to stop in at any of our 72 other locations and have any one of our 1,251 dedicated cooks prepare the dish for you.